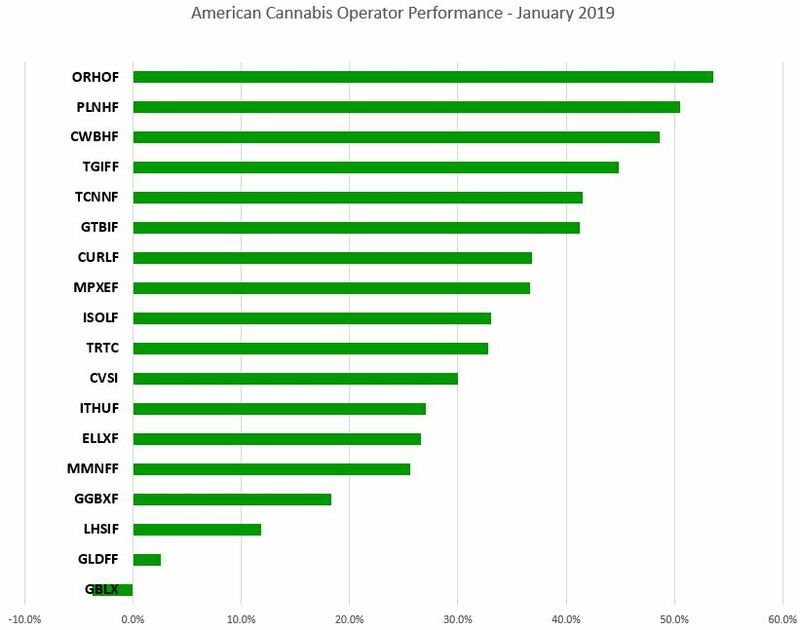 The three best performers included Origin House (CSE: OH) (OTC: ORHOF), Planet 13 Holdings (CSE: PLTH) (OTC: PLNHF) and Charlotte’s Web (CSE: CWEB) (OTC: CWBHF), all of which rose by more than 48%, with Charlotte’s Web hitting an all-time high, while GB Sciences (OTC: GBLX) was the only stock in the index to have a negative return. For February, the index will include 22 names, as United Cannabis (OTC: CNAB), which is focused on hemp, rejoins and multi-state operators Acreage Holdings (CSE: ACRG) (OTC: ACRGF), Cresco Labs (CSE: CL) (OTC: CRLBF), Harvest Health and Recreation (CSE: HARV) (OTC: HTHHF) and MJardin Group (CSE: MJAR) (OTC: MJARF) enter for the first time. We also removed MPX Bioceutical (CSE: MPX) (OTC: MPXEF) after its shareholders voted to approve the sale of its U.S. assets to iAnthus Capital (CSE: IAN) (OTC: ITHUF). In the next monthly review, we will summarize the performance for February and discuss any additions or deletions. Be sure to bookmark the page to stay current on American cannabis operators stock price movements within the day or from day-to-day.